On Tuesday, April 26th, outstanding Juniors and Seniors were honored in a ceremony in the Cross Center for Worship and the Performing Arts as Lexington Christian Academy’s newest members of the National Honor Society of Secondary Schools. At LCA, we hope to nurture academic brilliance, which is characterized by constant inquiry and a desire to mold the contours of new knowledge with an application toward real world situations. LCA has been a proud member of the National Honor Society since its charter was awarded in 1955. 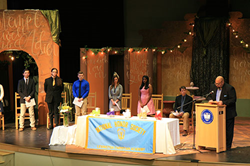 Since then, generations of LCA students have graduated as NHS inductees.